On this episode of our podcast My Favorite Theorem, my cohost Kevin Knudson and I were happy to talk with Nira Chamberlain. You can listen to the episode here or at kpknudson.com, where there is also a transcript. Dr. Chamberlain is an applied mathematician and President Designate of the Institute of Mathematics and its Applications in the UK. Last summer he was officially declared the World’s Most Interesting Mathematician in the Big Internet Math-Off hosted by Christian Lawson-Perfect at the Aperiodical. He chose to talk about the Lorenz equations, a mathematical system originally developed by Edward Lorenz to model the atmosphere and therefore the weather. Although the equations were fairly simple, Lorenz discovered that tiny changes in the inputs led to drastically different outputs. The Lorenz system is one of the most popular examples of chaotic behavior. (Longtime podcast listeners may remember that Jana Rodriguez Hertz also told us about a chaotic system in her episode of the podcast.) Lorenz's work led to the coining of the term “butterfly effect”: something as gentle as the flap of a butterfly's wings could cause a hurricane on the other side of the world. For more information on the Lorenz system, click here. The Lorenz attractor, one example of which is pictured at the top of this post, shows what this chaotic behavior looks like. The term attractor means it is a path to which particles in the system are pulled. But its complicated shape shows the system's chaotic behavior. Points traveling along the curve cross from one side to the other abruptly, and points that start at nearby locations in space may end up at very different places along the curve relatively quickly. For an interactive Lorenz attractor, complete with butterflies, see this page by Malin Christersson. For some beautiful images of Lorenz attractors, check out this page by Paul Bourke. The weather being such an interesting topic, we spent a lot of the podcast talking about it. The fact that the weather is a chaotic system means there isn’t much hope for increasing the accuracy of weather forecasts more than a few days out. Different weather models can sometimes have very different predictions. Dr. Chamberlain mentioned a 1987 storm that hit parts of the UK and northern France. The French model had predicted it but the British model had not. You can read more about the Great Storm of 1987 here. In each episode of the podcast, we ask our guest to pair their theorem with something. 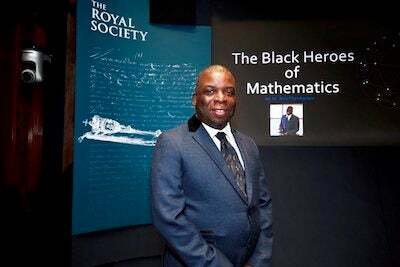 Dr. Chamberlain, whose parents are Jamaican, chose ackee yam and saltfish, a Jamaican dish, as the perfect accompaniment to the Lorenz equations. (If, like Kevin and me, you haven’t heard of ackee before, it’s a tropical and subtropical fruit with a consistency similar to scrambled eggs.) You’ll have to listen to the podcast to learn why they make such a good pair. You can find Dr. Chamberlain on his website and Twitter. You can find more information about the mathematicians and theorems featured in this podcast, along with other delightful mathematical treats, at kpknudson.com and here at Roots of Unity. A transcript is available here. You can subscribe to and review the podcast on iTunes and other podcast delivery systems. We love to hear from our listeners, so please drop us a line at myfavoritetheorem@gmail.com. Kevin Knudson’s handle on Twitter is @niveknosdunk, and mine is @evelynjlamb. The show itself also has a Twitter feed: @myfavethm and a Facebook page. Join us next time to learn another fascinating piece of mathematics.